From high end digital copy work to our state of the art large reprographics department, we can create just about anything! Whether you need printing, vinyl lettering, signs, engravings, screen printing, embroidery or trade show displays, we are your source for innovative designs and exciting promotional materials. We make it easy to complete your project from start to finish. 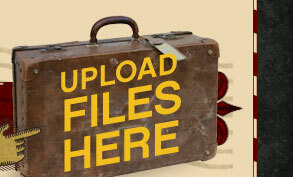 We accept file uploads directly from our Web site, including file formats in .pdf, .jpg, .tiff, and .eps. Once we have a proof ready for your review, we can present it to you in .pdf format, and even e-mail it to you. After the printing and finishing is complete, we'll gladly package it for pick-up, local delivery, or shipping. We ship anywhere in the 48 contiguous United States. In short, we can design, print, and deliver your entire project without you even coming through our doors. On the other hand, our showroom is full of brilliant ideas and impressive examples of our previous work. You’re welcome to browse as you look for inspiration for your next project. We are always available to help you brainstorm new ideas. If you have a question about a particular project you are working on, please contact us. We will always do our very best to help.